There is no cure for retinitis pigmentosa, an inherited condition that slowly constricts vision, but a British firm has reported early success with a revolutionary procedure that helps to repair a damaged retina. The treatment involves growing billions of ‘progenitor’ stem cells in a laboratory. These have the ability to transform themselves into other types of cell depending on where they are placed in the body. 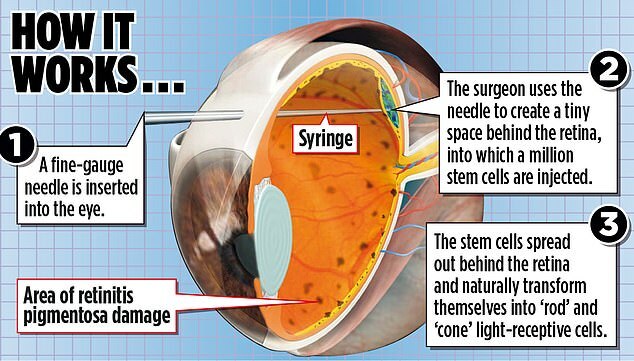 A million stem cells are injected into the back of the patient’s eyeball. Once there, they transform themselves into new light-sensitive cells called rods and cones which replace those lost prematurely to genetic flaws. 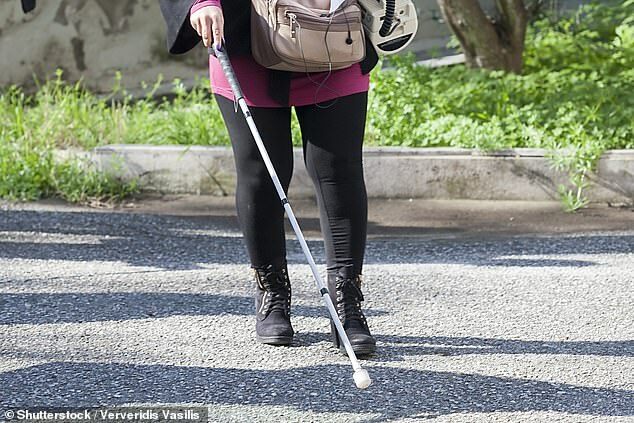 Tests on three patients – two men and a woman – who were legally blind produced ‘exciting’ results, according to Olav Hellebo, chief executive of UK biotech firm ReNeuron. Before the procedure, the three could read only the largest group of letters on a special eye test chart, but 18 days after being injected with the cells, their sight had improved to the point where they could read three letter sizes smaller. One patient achieved sufficient progress to no longer be classified as legally blind and another told her doctor that she was able to see the food on her plate for the first time in years. The three patients are all American but the development of the technology has been led by experts at ReNeuron in Bridgend, Wales. Nine more patients have been enrolled to test the procedure. Mr Hellebo said the woman, who had been ‘sceptical’ before the procedure, went from being able to see just nine letters on the eye test chart to 29. People are considered legally blind if they can read fewer than 36 letters on the 100-letter chart. ‘She said she could now see the food on her plate, which is really motivating for us to hear,’ he added. RP, which affects up to 25,000 people in Britain, is caused by about 100 inherited genetic defects, sometimes alone and sometimes in combination. Loss of vision can begin in childhood, adolescence or adulthood and starts with deteriorating night vision and peripheral vision which gradually narrows so only hazy tunnel vision eventually remains. Total blindness usually ensues.